rather than the stuttering mastering you!" "We believe that if you can speak fluently in any context, you can learn to speak fluently in all contexts." The Technology that is bringing self-expression to PWS. "If in any context you speak fluently, then you can learn how to speak fluently in ALL contexts!" Other people validate or determine my worth - what they say about me becomes my truth. People judge the content of what I am saying. People in authority are only interested in their own viewpoint; therefore, what I say will always be wrong to them. I must protect myself from being hurt by others. I must conceal my emotions. I got to fix this problem. I am worthless as a human being when I do not perform up to others expectations (perfectionism). My total value as a person is how I perform and especially "how" I speak. I need to be respected and loved in order to speak fluently. I am doing something "bad" to other people when I stutter. "It" (becoming fluent) works for everybody but me. 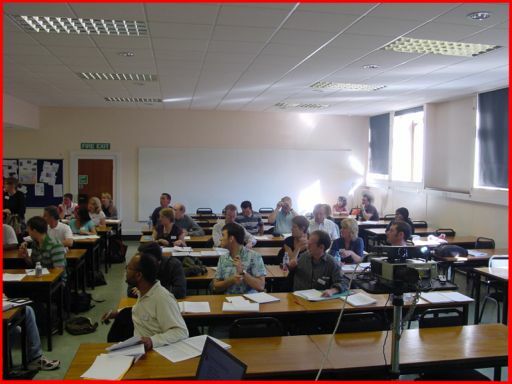 Then this " Mastering Stuttering Workshop" has much to offer you towards fluency. "Bobby's informal and humorous style belied a highly intelligent and intuitive mind. He is the first person I have met in all my years as a speech pathologist and person who stutters, who has a deep understanding of what the problem of blocking & stuttering really is - a 'social problem'. My mind has been opened up to new ideas and I have a completely new way of looking at my blocking. Most importantly, I now, for the first time in my life feel I can be totally fluent and it is in my power to do so. Thanks so much Bobby for all your support, kindness and love." "Do you ever anticipate stuttering, have negative feelings about stuttering, or even fear stuttering? Has this been the obstacle keeping you from complete breakthrough? Have thoughts and feelings about stuttering been directly linked to relapses after a therapy program? What if you could identify and then eliminate the cognitive and emotional process by which you do this? If you have always believed that you needed more than speech production techniques to earn freedom, you are right. The Mastering Stuttering workshop offers you powerful strategies for solving these problems. If you have had previous therapies and doubt your ability to change dramatically, there is hope. Neuro-Semantic strategies offer you that vital piece to your puzzle." "This approach makes sense. It is designed to unravel the complicated patterns, feelings, behaviors, triggers, etc. that created stuttering in the first place. It is a longer road (probably) before seeing solid results, but when you get to those results, they are yours forever! You learn to rewire your whole speaking system so it works when you want! "I love it. I am thrilled to have found a manual for something I've been doing by heart/intuition/instinct. Now I have more tools and deeper structures for rewiring - I'm looking forward to more in my readings. "Bobby is wonderful! Down to earth. Amazing. Brilliant. Humble. Quick witted. Fun and funny. Charming and practical." "This is definitely the missing link. If you want to achieve better fluency (and keep it! ), then this is the way to go." "Great people. Both participants and coaches - can't think of a better group of people to spend a weekend with." "I have seen proof that it works and that proof will give you the persistence to stick it out. I would recommend that other PWS try it and keep an open mind." "Bob gave me the tools to change my life. What I experienced this weekend will keep me at it until I succeed." Click here to read all the feedback from the workshops in Charlotte North Carolina (April & October 2003) and from Perth Australia (February 2004) and from Charlotte North Carolina (October 2004). John Harrison author of 'How to conquer your fears of speaking before people', who has fully overcome his stuttering problem so that for many years it has no longer been an issue, will be there for the duration of the workshop and will share his 'stuttering hexagon' with us. This helps us to step back from the problem of stammering and see that stammering is not simply a speech problem but about what you believe, how you perceive yourself and the world and how you exist as a dynamic system that can change. In these five days of training most of you will be entering into a brand new field of exciting discoveries. Neuro-Linguistic Programming (NLP) has been around since the mid-70's yet few people know about it. Newer still is the field of Neuro-Semantics® (NS) which I, along with my colleague, L. Michael Hall, Ph.D. have established. From these two fields of study, you will be experiencing some of the latest technologies in learning how to manage your own mind and control your own states - including learning how to gain state control in speaking more fluently. These two fields provide many different techniques for one to experience in learning how to manage one's own states and thought processes. Indeed, we have numerous case studies that prove that these technologies provide effective techniques for the person who stutters (PWS) to learn fluency. In gaining fluency, one must learn how to gain control of one's own states in all circumstances. Why is it that most PWS can speak fluently in some contexts - like when by themselves, when speaking to a spouse or some trusted person or when speaking to a pet and not speak fluently in other contexts? What is causing this to happen? Now, does it not stand to reason, that if a person can speak fluently in some contexts, that his/her mind-body system knows how to speak fluently? Does it not make sense that one does not need to re-learn how to speak? The person just needs to learn to move what they already know about speaking into other contexts of his/her life. We have learned that PWS do so due to negative thought patterns (mental frames of mind) that have been unconsciously learned. I (BB) have learned that blocking/stuttering is nothing more than a panic attack expressed in those muscles that control breathing and speaking. It is just that simple at the base level - blocking/stuttering is primary a learned behavior and can be un-learned. Treating blocking/stuttering is the same as treating panic disorders that NLP and NS have been successfully treating for many years. Now, NLP and NS offers a great deal of information including many techniques. Well, how does one organize the vast amount of knowledge under one umbrella of understanding? L. Michael Hall, Ph.D. has ingeniously provided the model call the "7 Matrices of the Mind." It is this model that these five days of intense training will follow. 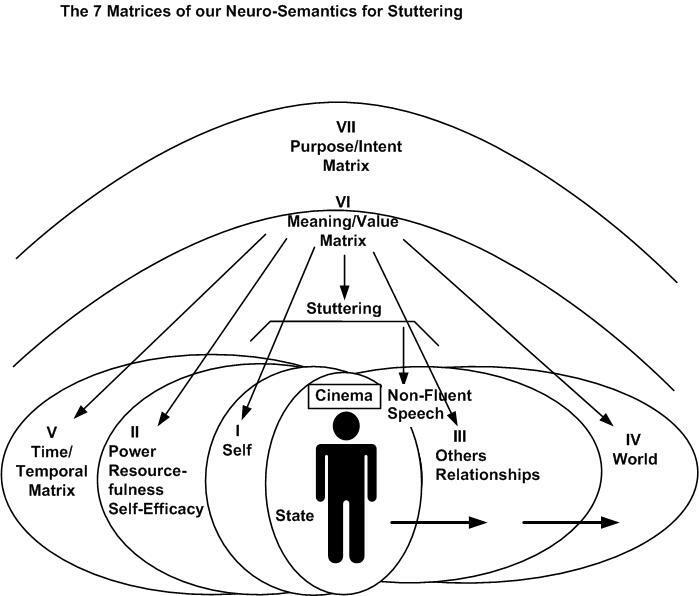 We have taken the "7 Matrices of the Mind Model" and used it to describe the "structure" of blocking/ stuttering. Once we understand "how" the mind-body system creates blocking/stuttering, we can break down the thinking that happens when you block/stutter and learn how you do it. Remember, you do not block/stutter all the time. So, what is the difference? Once we understand what you are doing inside your head to block/stutter, we can re-train the brain not to do that. We can teach the brain to take the knowledge of speaking fluently that you already know and transfer that knowledge to other contexts of your life. Using the the movie by the same name, Michael Hall, Ph.D. has provided a simple model for breaking down the complexity of how the mind-body system produces behavior - including blocking/stuttering. We have written an article entitled "How to Create a Good Dose of Stuttering" that goes into more detail about how this works. This model gives us a way to organize a large field of information, distinctions, and patterns so that we can work with it as we provide an understanding for a person wanting to develop more more fluency (See Figure 1). Meaning - To begin with, the PWS punctuates/classifies non-fluency as stuttering. The individual will associate fear and shame as to what stuttering might mean. The PWS evaluates blocking/stuttering as bad and unacceptable both for themselves and for the judgments of other people. We have learned that a common theme among PWS is that of fearing what others will think of them if they block/stutter. Of course, if the PWS had a very high opinion of themselves, they wouldn't care what others may or may not think of them. The low concept of "self" drives a lot of blocking/stuttering. Why do PWS tend to label (classify) blocking/stuttering as being so bad? Why is it that some children can stammer and even block/stutter but they eventually grow out of it? Why is it that some don't care what others may think of how they speak when the PWS tends to fear the judgments of others so desperately? I am offering conjecture here based on many years of doing psychotherapy. I believe that the reason this happens is primarily due to unconscious emotional hurts/pain that have become over riding thought patterns that drive other thinking. Due to these hurts, the child will have limiting beliefs about themselves and around the other matrices that I describe below- self, resourcefulness, time, others, world and purpose. This conclusion comes out of much therapeutic work with PWS. Also, there is the real possibility that some of this could be genetic? What Bob? I thought you have said that blocking/stuttering is not genetic. Yes, that is true and I still hold to that. However, I believe that predispositions can be genetic. There is the possibility, I don't know, that some folks are genetically pre-disposed to being a sensitive person and what bothers one child may not bother another one. However, the actually meanings placed on disfluency are learned and they can be un-learned. Self - A healthy Self Matrix is the difference between feeling worthy, valuable, respectable, and loveable and seeking to experience things in the world to obtain these experiences. With a healthy Self Matrix we can celebrate ourselves and value ourselves without putting our "self" on the line with the activities that we engage in. It allows us to separate person from behavior, self-esteem from self-confidence. But with a PWS, they define themselves with such statements as: "I am flawed." "I am broken." "I am inadequate." "I am stupid." "I am a retard." Etc. Indeed the list goes on and is heartbreaking as the PWS identifies with this behavior. Power - After the Self Matrix, the next most important one is the Power or Resource Matrix. This has to do with our sense of power to respond to the world. What can I do? What skills and resources can I develop? What are my aptitudes and capacities? How can I develop my potentials? The sense of power or resourcefulness makes all the difference in the world between living with a weak response style and a strong one. It’s the difference between learned helplessness and learned optimism. A PWS views themselves as "out of control" and "powerless" to overcome their blocking/stuttering. They tend to use terms like - "I cannot______." "I cannot speak in public." "I cannot order in a restaurant." "I cannot talk on the phone." Time - The time matrix entails our orientation to the time zones (past, present, and future). Time plays an important role in the mind of the PWS. The meanings he gives about this understanding of Time powerfully influences a great many of his emotions and so often, his understanding of time is his enemy instead of his friend. Instead of thinking of time as something to simply recognize and embrace, he fights against it because of his experiences of the past and his fears of the future. The past means embarrassment, humiliation, abandonment, guilt, shame, etc. The present means more of the same and the future offers little hope. So many PWS, when they do look to the future it is with what in psychology is called anticipatory anxiety. They anticipate blocking/stuttering which almost certainly guarantees that they will block/stutter. And/or they plan ahead as to what to say; what words to choose that stand the least amount of chance of blocking on. Indeed, one word summarizes the PWS concept of the future – anxiety. Instead of hope and excitement there is nothing but more fear and anxiety. Others - This matrix reflects how we have mapped out our understandings, beliefs, and expectations of people – those we like and connect with, those in whom we invest ourselves, and those we dislike and avoid. It relates to our views and concepts about relationships, love, associations, authority, roles, teams, races, cultures, arguments, conflicts, forgiveness and all of the other relational emotions. This is the matrix, probably more than any other, that drives blocking/stuttering. Gary, one of my clients, best summed it up: “I am what I think other people think I am." The fear of what others may think of their blocking/stuttering drives much blocking/stuttering. Indeed, in fearing the judgment of others, PWS, judge others by mind-reading or guessing what they may or may not think of their blocking/stuttering. I routinely ask this question of my PWS clients, “If you absolutely did not care what other people thought of your blocking/ stuttering, what would change about your speech?” In every case, they say that it will either greatly improve or totally go away. Now, in my book, that is significant. World - The world matrix has to do with everything outside of ourselves in all of the contexts in which we act and relate. It can refer to our immediate world of family and home, to the larger world of community and village, to the world of work and career, professional organizations, physics, economics, politics, etc. To a PWS, they view the world as a fearful place - a place of judgment, embarrassment, etc. In each of the matrices, we have numerous patterns to assist the PWS in re-ordering or re-structuring that matrix. We are talking about de-structuring the old un-useful ways of thinking that creates the blocking/ stuttering and creating new ways of thinking that will create matrices that will produce fluency in all contexts. We will be providing many patterns in the training manual - far more than we can cover in five days. However, my goal will be to cover some in each matrix. And, in covering them during the training, you will know how to use the other ones on your own or with someone. Associating/Dissociating - These two simple neurological processes determine so much about our state. To understand the difference and to know how to associate "inside" a frame of mind and to be able to "step outside" or dissociate from a frame of mind to another frame of mind is essential to state control. When we "associate" into a state we are inside that state and we are looking through our eyes. When we "dissociate" from a state we "step outside" that state and we can see ourselves. But, when we "step outside" a state we are always "inside" another state for we cannot not be inside some state of mind. Editing Your Movies - Our brains process at a very primary level from the images we have inside our head. Our images are composed of pictures, sounds, feelings, smells and taste. It is from these primal experiences that we re-present on the screen of our minds our experiences. What we see, we re-present with pictures. What we hear we re-present with sounds, etc. Now, inside these pictures, sounds and feelings are smaller qualities. Is the picture you are seeing in color or is it black and white? Is the picture a movie or is it a still photograph? Is it panoramic or is it framed like a small picture? Etc. Likewise, are the sounds you are hearing loud sounds or soft sounds? Is that feeling when you block a heavy feeling or a light feeling? These smaller qualities of our images exist "inside" the larger pictures, sounds and feelings. We shall review about these qualities. You will learn how to "edit" your own movies. Well-Formed Outcome for Fluency - Early on the first day of the training, we want you to set up a clearly defined outcome for your five days of training around the subject of fluency. NLP has provided a most useful tool called The Well-Formed Outcome. Through a series of cleaver questions, you will be doing critical thinking on your own outcome for fluency. State Management # 101 - Gaining fluency is all about "state control." You have a certain state of mind when you speak fluently and you have a certain state of mind when you block. You will be practicing through several exercises about how to switch from one state to another at will. State Accessing and Anchoring - In NLP we call a trigger an "anchor." How do you know when to block? That internal or external event that causes you to access a block is a "trigger" or an "anchor." We will practice accessing and anchoring in a resource state for fluency. The Basic Meta-Stating Pattern - In this basic Meta-Stating Pattern we will learn "how" to apply one state of mind to another. This is a major key to understanding how to run one's own brain and maintain ones on state. You will learn how to apply a resource state like "courage" to the negative "fear" state of blocking. What happens when you apply "courage" or "faith" to "fear?" "Emotions" are Just "Signals" Pattern - De-Commissioning Emotions. This is a pattern for learning how to recognize the signal and message value of our emotions and to use even the “negative” emotions positively without treating our Emotions as Chief Counselor and CEO. Learning how to do this is crucial to overcome stuttering. Changing Meaning by Reframing - All meaning is a "constructed" reality. By that I mean that all the meanings we give anything, either internal or external, is a construction of our images and of the word meanings we give them. Because all meaning is constructed meaning, we can choose to give different meanings to events. We will learn the two basic ways of changing meaning: content reframing and context reframing. Changing Meaning with the "Miracle Pattern" - This is a pattern from Brief Therapy for stepping out of the thinking that has created the problems with stuttering and into a whole new way of thinking. It provides a way to welcome some magic into your life. Meta “Yes” & Meta “No” Pattern - This pattern empowers us to say “Hell No!” to any sick, toxic, or morbid game. And to say a great big glorious “Yes!” to every game that would enrich and empower us towards fluency. This is a simple yet quite profound pattern for changing meaning. Meta-Stating Semantic Fears - You know what “semantic fears” are, don’t you? They are those ideas or concepts that “get” you like fear and anxiety. Those two villains drive much blocking and stuttering. This pattern will assist you in flushing them out and not to take counsel of them but to take counsel of your “higher mind” where your resources lie. Changing Meaning by Changing Your Language - We give meaning to our internal images with "words." "Words" are the primary drivers of consciousness. NLP has provided us with a fantastic model that gives the "structure" of how we language ourselves. This model is called The Meta-Model of Language. We will briefly introduce it as we ask ourselves some very critical questions about "how" we are languaging our reality. Does it serve us? If not, what kind of language will serve us? Perceptual Positions for Developing Flexibility of Consciousness - The realization that we humans operate from five basic ways of looking at experience offers tremendous potential in state control and in the enhancing of our communication. Essential to state control and accessing valuable feedback, these five perceptual positions are invaluable to gaining fluency. These positions are: 1st Position - position of "self," 2nd Position - the "other" position, 3rd Position - position of objectivity, 4th Position - the position of the system or organization and 5th Position - the universal or "God" position (the position of fluency for many PWS). You may wish to read the article entitled "Gary's Fluency Strategy" to discover these positions in action. Meta-Stating Acceptance, Appreciation and Esteem for Self - As one looks at the “Self” Matrix one quickly realizes those who block/stutter can easily form a low opinion of themselves. Moving from dis-fluency to fluency requires that one stop identifying one’s sense of self with just a particular speech pattern and begin to accept, appreciate and esteem oneself not as a human “doing” but as a human “being.” This pattern is specifically designed for that purpose and has proven quite effective with hundreds of clients and training participants. It has been field tested all over the world. The Swish Pattern: Swish to “the Me” for whom a Given Context or Task is No Problem - The Swish Pattern affects a rewiring (as it were) of our old responses and wiring in new responses to the same old triggers. This makes it very powerful since it puts you in charge of your responses. This makes this pattern very generative. It not merely substitutes a new behavior - it creates a new direction. Re-Imprinting Past Imprints: Creating a New “Self” - Richard Bandler said, “It is never too late to have a happy childhood.” Those words sums up the thrust of this pattern and indeed many of the NLP/NS patterns. For at the root of many of these patterns is the desire to change the unwanted meanings from old mental imprints to new more useful meanings. The Drop-Down-Through to Rise Up Pattern - This pattern evokes the those frames of mind that causes the blocking/stuttering. It moves the person on down (or up) to the level where there is no meaning and on out to higher frames of references that provide those resourceful frames for meta-stating away the problems of fear and anxiety. At least this pattern will tame the frames so that they are no longer a problem. This is the single most effective pattern that has proven most effective in leading PWS to fluency. We will spend necessary time on this pattern. Foregrounding Resources Game - As the Drop Down Through Game went “down” for resources, the Foregrounding Resources Game goes “back” to those resources in the “back of your mind.” They are “back there.” This Game will assist you in discovering them and bringing them to the “foreground” of your mind where you can “see” them. What would happen if you placed stuttering into the background of your mind and fluency into the foreground of your mind? By learning to foreground the content of what you are saying and backgrounding "how" you say it, you will be well on your way to fluency. Meta-Stating Your Power Zone - This pattern gives us the power to form and own our most basic and fundamental powers from which all other forms of human strength arise. You learn to own your two private powers of thinking and feeling and your two public powers of speaking and behaving. Indeed, a common theme of PWS is the "giving away of their power" to other people. Circle of Excellence - The Circle of Excellence Pattern has been around for many years in NLP. It is quite useful in building a powerful resource state. This is done by "visually" placing resources inside an imaginary circle. By stepping "into" your "Circle of Excellence" you step into all those resources at once. Meta-Stating Intention - David Plotkin said, "The most successful people know what they want and why they want it." In my opinion, this pattern is one of the best that Michael Hall has come up with in his basic Meta-Stating training. Obviously, blocking/stuttering does not fulfill you higher intentions for yourself. Your higher intentions are to speak fluently but you find yourself blocking/stuttering. This pattern is designed to get what you attend to (speaking) in line with what you desire from a higher level intention (fluency). Six-Step Reframing - This pattern works for those behaviors that you don't like and would like to stop and which don't seem to respond to conscious reframing. The Six-Step Reframing pattern provides a way to deal with secondary-gain behaviors in a way that's suitable for you as a whole person. It does that by reframing old unconscious programs. It brings about an integration of conscious and unconscious parts. You can use it for behaviors, habits, emotions and symptoms that you don't appreciate. With this pattern, we will use it as a guide for languaging ourselves. It is doubtful that we will have time to go through and practice the full pattern. The pattern, however, provides a powerful way of languaging oneself and others in finding new and more healthier ways to meet the needs of old problem frames of mind. Modeling Optimism - Being optimistic about gaining fluency is obviously crucial to gaining fluency. What makes up the dynamic state that we label “optimism?” Based on Seligman’s “Learned Helplessness,” and “Learned Optimism” research, this pattern teaches us to not "Personalize" things like what we perceive others may think of our blocking/stuttering. It teaches us not to allow this personalization to "Pervade" all areas of our lives and it teaches us to to believe that blocking/stuttering is Permanent. Many PWS have found this pattern quite helpful. Meta-Stating Courage Pattern - Here our purpose is to design engineer a powerful state of courage. The components of “courage” may vary depending upon how a person has ordered a particular strategy or format of “courage.” This pattern brings out from within you that special "recipe" for courage that you have inside. And, then we take that recipe, and mix it all up into a resourceful state of courage. Sorting for Past, Present or Future - Where do you focus most of your attention C to the past, to the present or to the future? Most PWS tend to focus on the past knowing that they have always blocked/ stuttered and because they have been unable to "fix it" they tend to believe that blocking/stuttering is permanent. Changing "where" you place your focus and "what" you focus on can make profound changes in your life. The Meaning of your Time-Line - How does your brain tell the difference between the past, the present the future? How do you know the difference between the "far" past and the more "recent' past? Where do you see the present? Where do you see the future? All these questions are important as to our personality and as to overcoming blocking/stuttering. Letting Go of Negative Emotions - A key contribution of Time-Lining is the ability to both easily and quickly let go of negative emotions from a painful memory. First popularized by Tad James of Advanced Neuro-Dynamics, this model allows one from a safe position to let the steam out of an old negative emotion. Meta-Model Questions for Exploring Meaning - Here we will review some of the key questions of the Meta-Model of Language especially in light of how we language ourselves in relation to others. For instance, when PWS says, "I am what other people think I am?" we can critically challenge that statement by asking questions from the Meta-Model (which is the foundational model of all NLP) such as, "How do you know?" "Says who?" "What makes it so?" "You are more than what others think of you, aren't you?" "What are you that is more than what others think of you?" Reviewing the "Power Zone" Pattern - First introduced in Chapter 4, this critical model enables us to own and to take responsibility for our own powers of thinking, feeling, speaking and behaving. Now, by presupposition, when we own our own powers, we should give other people the right to "own" their own powers without our mind-reading their judgment of how they may or may not think-feel about how we speak. Hence, I have added a step to Michael's original pattern for leading one to not only claim one's four powers of thinking, feeling, speaking and behaving but of also "pushing" out of one's life the allowing of others to control your power zone. Responsibility To / For - Here we want to develop an understanding of the difference between being responsible "to" someone and being responsible "for" someone. PWS tend to believe that they are responsible "for" the other person's embarrassment, judgment, etc. that they may or may not make concerning the PWS blocking/stuttering. As decent human beings we are all responsible "to" other people we come in contact with. We are responsible "to" them as to how we behave towards them but we are not responsible for them as they must own their own power zone. Developing Healthy Boundaries - In relating healthy to others, we must appreciate where our "nose begins and ends" and where the "nose of others begins and ends." To allow others "rent free space" inside our heads as we give them permission to determine our states of mind is not setting proper boundaries. We want to learn to say "no" to letting others control our mind-body states. We want to learn to say "no" to giving them permission to define who we are. NLP Presuppositions - The basic NLP presuppositions express some of the central ideas that govern the field of NLP. Not only is NLP built upon these presuppositions, but out of them come the impactful techniques that allow people more choice and flexibility in their responses. All through the 3-day training, I will be referring to these presuppositions or beliefs. The Map-Territory Distinction - This is one of the key NLP presuppositions. It comes from Alfred Korzybski's classic 1933 work Science and Sanity which, in my opinion, is the true theoretical foundation for NLP and NS. I have separated out this belief for special attention. It simply says that our internal representations or images are not the world but they are a metaphorical or symbolic representation of our experience of the world. Well, so what? In my opinion, a great definition of mental health is when we map out inside our heads a representation that reflects as symbolically accurate as possible the world we presently live in and we desire to have in the future. When we live off of a 20 year old map or a 30 year old childish map, we are not operating from a healthy map. We will cover this belief throughout the training as is it central. You may wish to read the article on the web site entitled "7 Keys to Personal Change" for a more thorough treatment of this belief. The Well-Formed Outcome Model - First introduced in Chapter 1, this model is also useful in determining a well suited desired outcome for ourselves. Taking an Intentional Stance - In "consciousness" we have both attentions and intentions. Our "attentions" are what we are paying attention to. Our "intentions" are our higher frames of reference, usually unconscious that drive our every day attentions. By strengthening our highest intentional meanings, we can begin to live more purposefully as we access and use the higher levels of our mind to direct our everyday attentions. The PWS will want to align their intention of speaking fluently with their attention of actually speaking fluently. Meta-Alignment Pattern - This pattern is designed for ending the incongruence and the internal conflict that undermines personal power. This pattern clears up such incongruence by aligning everyday activities and behaviors with ones’ highest values, purposes, and beliefs. This is a great pattern for the PWS desiring more congruence in the way he or she works, plays, or moves through the world. NOTE: Time will not permit covering all of these patterns during the training. However, we will cover those that are most crucial to you becoming more fluent. You will be provided with a training manual with a detailed description of each pattern. Training Format: The training will consists of presentations on various topics/patterns followed by a demo of the trainer taking a participant through a pattern. After that, the training will break up in groups of two or three for group work on each pattern. A Model of Communication about human processing that empowers us to "run our own brain." Using the "languages" of mind (our internal cinema of sights, sounds, and sensations) along with language, we "think" and frame things using these see, hear, and feel dimensions. As were present data to ourselves on the inner screen of consciousness, that internal movie signals our bodies to go into a state¾a mind-body or neuro-linguistic state and that governs the quality of our life and experiences. Developed by a linguistic and computer student about human excellence and genius, NLP provides insights and specific step-by-step techniques for running your own brain, managing your own states, communicating more effectively and elegantly with yourself and others, and replicating human expertise. While it sounds like a big word, it refers to a simple fact. Namely that we create meanings in our minds (semantics) and we get those meanings incorporated into our bodies (neurology). That why, when things mean something to us¾ we feel it in our bodies. The meanings show up in what we call "emotions." The meanings take the form of values, ideas, beliefs, understandings, paradigms, mental models, frames, etc. Neuro-Semantics provides a model of how we humans make meaning as we evaluate experiences, events, words, etc. It's a model of how we then live in the world of Meaning that we construct or inherit. Neuro-Semantics describes the frames of reference we use as we move through life and the frames of meaning that we construct. It creates the Matrix of Frames in which we live and from which we operate. Neuro-Semantics arose from the Meta-States model which provides a way to think about the levels of states or mind that we experience all the time. That's because we never just think. As soon as we think or feel¾ we then experience thoughts and feelings about that first thought, then other thoughts-and-feelings about that thought, and so on. Technically this is called self-reflective consciousness. Practically, it's the Frames for the Games that we play in life. Mastering Blocking and Stuttering: A Cognitive Approaching to Achieving Fluency (2004) by Bobby G. Bodenhamer - This book was recently released by Crown House Publishers in Wales UK. Secrets of Personal Mastery by L. Michael Hall, Ph.D.
Dragon Slaying: Dragons to Princes by L. Michael Hall, Ph.D. Mind to Muscle Pattern: A Case Study by Bobby G. Bodenhamer, D. Min. Embodying Negative Emotions: Guess Where a Stutterer Embodies His or Her Emotion? By Bobby G. Bodenhamer with L. Michael Hall, Ph.D.
Foreground-Background: Qualities that Make a Powerful Difference By Bobby G Bodenhamer, D.Min. Un-Insult-Ability: The Identity Gestalt of Living Beyond a Fragile Ego by L. Michael Hall, Ph.D. The Stress Fight/ Flight/ Freeze Pattern: A “Self-Help” Pattern in Overcoming Blocking/ Stuttering by Bobby G. Bodenhamer, D.Min. How to Create a Good Dose of Stuttering: The Neuro-Semantic Structure of Stuttering by L. Michael Hall, Ph.D. and Bobby G. Bodenhamer, D. Min. Rising Up to Drop-Down Through: The Art of Dropping-Down Through Experiences; Even Stuttering While Rising Higher by Bobby G. Bodenhamer, D. Min. and L. Michael Hall, Ph.D.
From Stuttering to Stability: A Case Study by Bob Bodenhamer, D. Min. The Art of Enjoying Non-Fluency by L. Michael Hall, Ph.D. Battling With Symptoms or Changing the Frameworks? by L. Michael Hall, Ph.D.
A Model for Resolving Stuttering by Bobby G. Bodenhamer, D. Min. and L. Michael Hall, Ph.D.
E-mail, call or fax your name, address, phone numbers and email address with the method of payment. This training follows the NSA Annual Meeting in Long Beach. Attend both if you wish. Guarantee: Neuro-Semantic Trainings through NLP of Gastonia are 100% Guaranteed C 100% of your money back if at the end of the first day you are not satisfied that it is worth every dollar and much more. We make our Trainings Risk Free to invite you to step up to this new level of personal freedom and mastery. ©2005-2006 Bobby G. Bodenhamer, D. Min. All rights reserved.